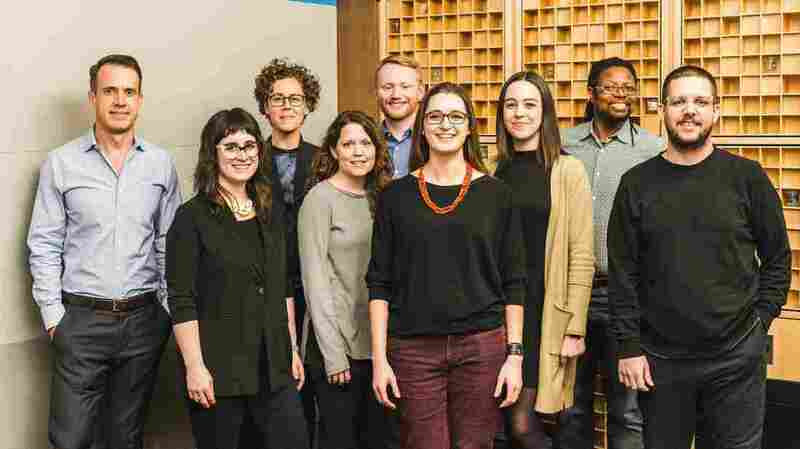 Faces of NPR: Design Team : NPR Extra An Inside Look into NPR's Design Team. Faces Of NPR is a weekly feature that showcases the people behind NPR, from the voices you hear every day on the radio to the ones who work outside of the recording studio. You'll find out about what they do and what inspires them. 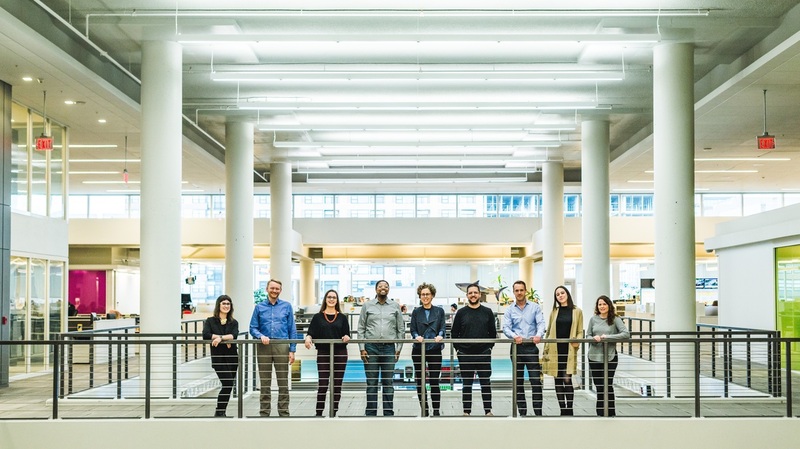 This week's post features the NPR Design team. From left to right: Scott Stroud, Kaytee Nesmith, Liz Danzico, Libby Bawcombe, Dan Newman, Veronica Erb, Katie Briggs, Vince Farquharson, and Josh Osborne. You are all on the Design team. What are your roles? Libby Bawcombe: I'm a senior product designer. I work in user experience and visual design of our digital products, and I write for NPR Design's blog. 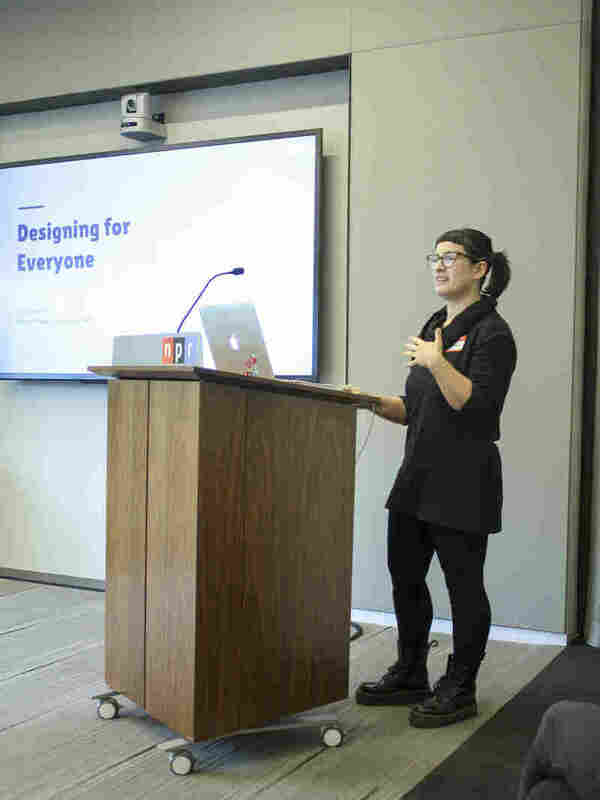 Liz Danzico: I'm the creative director, overseeing and guiding both the visual and user experience across NPR digital products, platforms, and services. Katie Briggs: I'm a product designer. I spend a lot of time thinking about how the things we build affect the users we serve, especially at the Member station level. Vince Farquharson: I'm a senior interaction designer. I spend most of my time wireframing and providing visuals for multiplatform NPR experiences. I work with internal teams and external partners. Kaytee Nesmith: I'm a senior product designer. I use design and research techniques to figure out how to make life easier for station staffers — and the folks here who support to them. Dan Newman: I'm a deputy creative director. 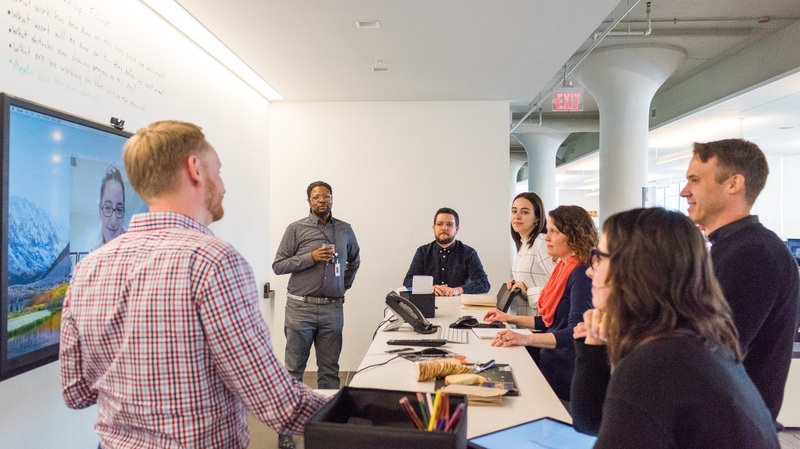 I help lead the team on a day-to-day basis, connect divergent workstreams, facilitate strategic conversations, and design engaging interactions. Scott Stroud: I'm a lead user experience strategist. I think about the goals of the audience, Member stations, and NPR. I help tell the story of how we craft experiences to deliver positive outcomes for all three. Josh Osborne: I'm a design technologist. Most of my time is spent designing and building NPR.org. I also build and maintain open-source tools that help our teams work better together. Veronica Erb: I'm a senior interaction designer. I have three specialties on the team: research and interviews, information architecture, and workshop facilitation. The Design team at a scrum meeting. Liz Danzico: I learned about an open position at NPR from someone I used to work with. 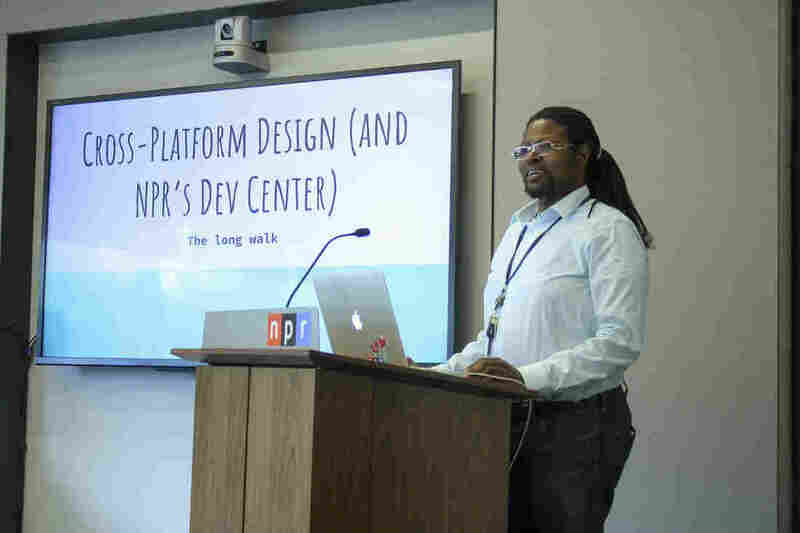 I hadn't considered design at NPR before, and was compelled once I learned more about it. NPR had designers! My advice would be to be curious across boundaries. While my role is explicitly about "design," the whole of a user's experience is far broader than that term would suggest. In considering a management position, practice finding ways to create pathways for your teammates/colleagues so they can do their best work. Dan Newman: I applied to NPR for my dream job. I didn't know anyone here, so I applied blindly through the careers site — without any expectations. I was delighted just to visit NPR for an interview. For all the advice out there that says you have to know the right person to have a shot at your dream job, that wasn't the case here. In showing my best work and telling my story, I got to where I wanted to be. Scott Stroud: I started in 2006 when NPR leadership first built a team focused on user experience. This team evolved into our current Design group. My career advice for designers is to consider everything an iterative work in progress, including your personal journey. Clarity comes with time, experimentation, and commitment. 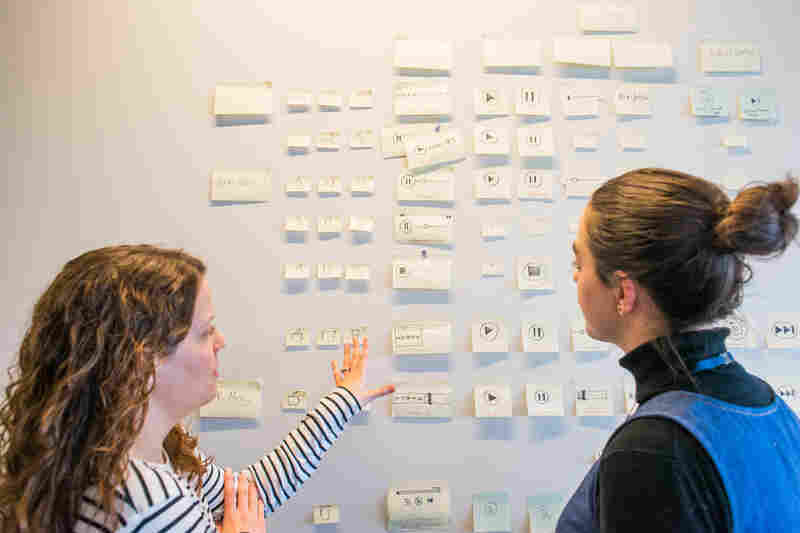 What does the NPR Design team do exactly? We research, prototype, and design user experiences for the public across the places they are and will be — websites, smartphones, tablets, connected cars, connected homes, and emerging technology — places we haven't yet imagined. We contribute to projects at all stages of development, from inception through completion. We also collaborate closely with developers, product owners, scrum masters, QA engineers, and our colleagues across departments at NPR. What are some of the goals of the Design team? From a process standpoint, we aim to make the invisible visible, and help others do so as well, ensuring that everyone has a voice whether that be about a product, a process, or something else. From a product standpoint, we aim to represent the user's point of view in every conversation. Your team sits near NPR Music. How do you get any work done with all that music from the Tiny Desk concerts? Libby and Katie discuss in front of Veronica's sticky notes near the NPR Music green room. Veronica Erb: Working full-time from St. Louis, I crave more behind-the-scenes Tiny Desk concert moments. Happily, I occasionally get stories and sometimes photos from my fellow designers, including reports that artists comment (and sometimes sing!) when they notice the wall of sticky notes that I created outside the Green Room. When I'm in town, I prioritize seeing the concerts. Breaks are an important part of creating high quality work! Vince Farquharson: Working with our fast-moving teams, there's always a need to dive deep into a challenge. But I've found Tiny Desk concerts are great for getting a chance to take a breath. I get to see colleagues that I don't work with every day, and enjoy a treat that few organizations could provide. I even sort of like it when the piano tuner visits! Kaytee Nesmith: I produce my best work when I have a good number of breaks or changes of scenery throughout the day, so Tiny Desk concerts are constantly a delight. Sometimes, though, it's hard for me to remember to take a break. On those days, Tiny Desk concerts are a welcome reminder that, hey, it's time to stop staring at the screen for a few minutes. If the piano tuner's around, though, you can expect me to retreat to a quiet hiding place! Kaytee presenting at a creative lunch" for AIGA DC's "DC Design Week." Libby Bawcombe: I'm on the NPR news app team, which is relaunching the iPhone app in early April. Helping redesign a beloved app is complicated but rewarding. The best part is user-testing our ideas, and getting feedback from our readers and listeners who use early versions of the beta app. Katie Briggs: I'm leading user testing on some experimental smart speaker skills we created earlier this year. I'm excited to learn how different concepts test with a variety of users, and to see which of our assumptions about voice assistant platforms are correct or incorrect — which can provide a lot of valuable insight. Josh Osborne: Along with the rest of the publishing team in Digital Media, I'm working to improve the way NPR.org visitors connect with their Member stations. Instead of automatically choosing a station based on their location, we aim to offer a choice of up to three of the closest stations. With that, we're piloting an experiment to syndicate Member station stories on our website, bringing the large NPR.org audience closer to their Member stations and to the news they care about. What past project are you particularly proud of? Liz Danzico: A couple summers ago, I collaborated with NPR's Audience Insights and Research team for a project they led called "Future Audiences," which was intended to explore the attitudes and behaviors of 18-32 year-old audiences. We created a Future Audiences Toolkit that made this research actionable, and conducted workshops and webinars to kickstart its usage. Many of the insights from that work are still in circulation today. Vince Farquharson: I'll have to call a tie between The NPR One Webapp and NPR One for Xbox. The former was with our internal Enterprise team, and the latter was with our development partners at InfernoRed. I like these because it was necessary for me to become both the visual and interaction lead for both projects. I pushed myself outside my comfort zone, and the results were great. Additionally, these projects are redefining what it means to be an audio-driven organization on visual platforms. Vince presenting at AIGA DC's "DC Design Week." Katie Briggs: I recently came to NPR from Member station KPCC, where I helped found Public Media Potluck. This community of stations and other public media entities embody the mission of the Public Media Kitchen, a collection of digital tools built for station use and collaboration. Part of why I came to NPR was to help advance the interstation ecosystem, so I've remained involved with Public Media Potluck. We had our first in-person meet-up in January 2018, which hosted representatives from more than a dozen organizations. By all measurements, it was a great success! If the team had a podcast (not about design) what would it be about? Office supplies. We are crazy for sticky notes, round dot labels, permanent markers, and rolls of blank paper. We have lots of opinions on which supplies work best for brainstorming and design-thinking exercises. Liz Danzico: Seeing Steve Martin play the banjo. Vince Farquharson: The Cristina Pato Trio. That one was cathartic because I had a killer headache that day, and jazz with bagpipes was the cure. Knocked that headache right out. I bought her album the same day. Kaytee Nesmith: George Clinton & The P-Funk All Stars. You can even see me losing my entire mind in the video. I had to have that funk. Runner-up: Chelsea Wolfe. Kaytee Nesmith: Radiotopia's Mortified podcast is so delightful. It has made me audibly laugh to myself in public more times than I'd like to admit. Dan Newman: I can't get enough of the CW's Crazy Ex-Girlfriend. It's into season three now, and while it deftly deals with real issues around mental illness, it's also an escapist musical comedy. When paired with Glen Weldon's exhaustive, definitive rankings of the songs in every season, it is perfection. Josh Osborne: David Chang's Ugly Delicious has been my go-to lately. Each episode examines the cultural, sociological, and culinary history of a specific popular food. The fried rice episode was incredible. Disclaimer: Do not watch Ugly Delicious after dinner if you're trying not to snack after dark. Dan Newman: I'm currently re-reading the Harry Potter series for the the first time in probably a decade. One of the things I had forgotten from the early books was how wizards marveled at Muggle technology. It reminds me of Arthur C. Clarke's third law: "Any sufficiently advanced technology is indistinguishable from magic." We don't have magic at our disposal, of course, but I feel inspired to continue making our products and platforms feel more magical. Scott Stroud: Celeste Headlee's book We Need to Talk: How to Have Conversations That Matter. Headlee is a public radio journalist who translates what she's learned from interviewing guests and navigating difficult work conversations into rules for deeper human connection. Josh Osborne: I'm constantly inspired by my Are.na feed. It's an open platform for creative thinking and research. For me, every project starts with an empty Are.na channel and a dream. This channel comprising only of rave zines is a current favorite. Name tags from events that Dan attended. Liz Danzico: A stack of sticky notes and a variety of pens. Together, they're the lightest-weight tool you can have for making ideas public. Kaytee Nesmith: A small teapot and cup. Lots of pens and markers. A teeny-tiny ceramic vase with a dried-up rose. A small Maleficent figurine given to me by a colleague. A few crystals. A small collection of buttons and enamel pins. My favorite thing on my desk, though, is a bottle of Martinelli's Sparkling Cider the team gave to me on my first day! 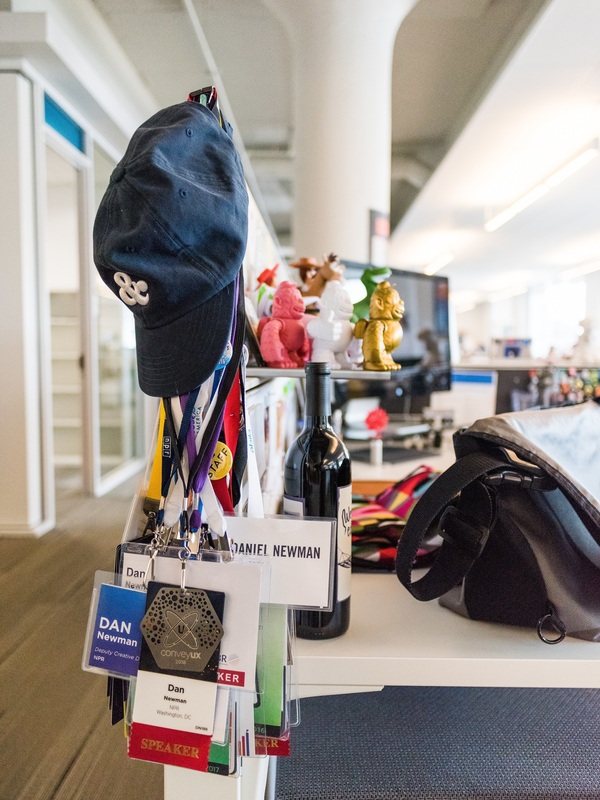 Dan Newman: For many years, through several jobs, my desk has been my toybox. Close at hand are my collection of Toy Story figures, vinyl Freddies from MailChimp, my (now recalled, shhh...) Buckyballs magnets, my CTA Brio-style train, and much more. My most prized toy is the Wreck-It Ralph figure that John C. Reilly signed for me when he performed at the Tiny Desk. Liz Danzico: Take a morning run with my dog, work with emerging design students, try to play the cello (a lifelong process), and hang out with my (fairly large) family. Vince Farquharson: I make uncanny electronic art and furniture. I love new materials, so I'm always experimenting at adapting construction materials into art. I visit my family across town every weekend. I'm also a sous chef at home. Kaytee Nesmith: I love being with my dog, cooking and embroidering. I'm working on a new project with a friend of mine, and we're making really, really loud music (and corresponding audio visualizations)! If you had to give each other superlatives, what would some be? Dan Newman: Most Inspiring. This is the best team I've ever worked on. Everyone is so knowledgeable, so innately curious, and so friendly. I am inspired every day to do my best work because of the enthusiasm and partnership of my colleagues. Scott Stroud: Most Encouraging. Every member of the team recognizes the unique contribution of other team members and individuals throughout NPR. We celebrate everyone's breakthroughs and actively elevate new voices through hiring and internships. Libby Bawcombe: Most Likely To Wear Black. It's no secret that artsy designer types tend to gravitate toward darker hues. What is your favorite thing about working at NPR? 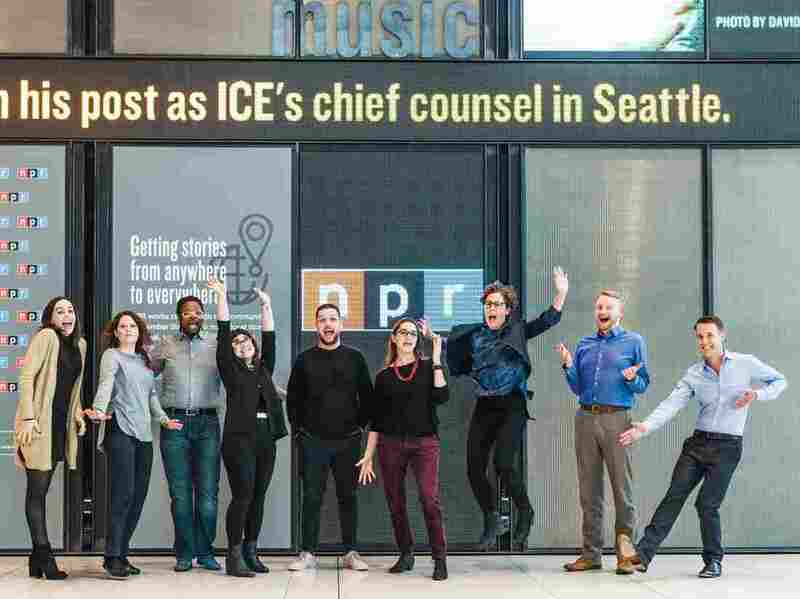 Libby Bawcombe: While I enjoy working on a major project like the NPR news app, I also get to work on a variety of awesome side projects with smart people who believe in the importance of public media. Every day feels interesting and different. Plus, my husband works for PBS, and we love being a public media family. You can bet there's a lot of Wow in the World and PBS Kids at home! Liz Danzico: I love seeing and hearing NPR things out in the world — and watching people's reactions to them. It's such an honor to be a part of the smart teams and processes that make these things. To see them in real time with real people is always irrationally exciting! Kaytee Nesmith: I love that all of our design work centers around a mission that really, truly resonates with me, and I love figuring out how to solve the design challenges that presents. Also, being able to text my friends things like, "HI I JUST MADE EYE CONTACT WITH KIM DEAL FROM MY DESK" is deeply satisfying.